Finalizing its 2013 report on U.S. greenhouse gas emissions, the Energy Information Administration (EIA) projects an increase of 2 percent for the year, the first in three years. Looking out over the longer term, U.S. greenhouse gas emissions have been in a downtrend, one that the EIA expects will continue, with emissions from energy generation declining four out of the past six years since their 2007 peak. The EIA attributes 2013’s expected rise in carbon and greenhouse gas emissions to a small increase in coal consumption in the U.S. power sector. With U.S. natural gas prices coming off lows, electric utilities have been using more coal this past year. 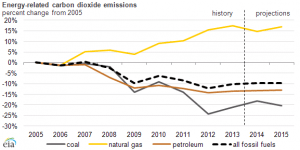 U.S. greenhouse gas emissions reached a peak in 2007. Since then, utilities switching to cheaper natural gas from coal, along with growing use of non-hydro renewable energy sources such as solar and wind power, helped drive U.S. greenhouse gas emissions to a historic low in April, 2012, when they were 12 percent below 2005 levels. 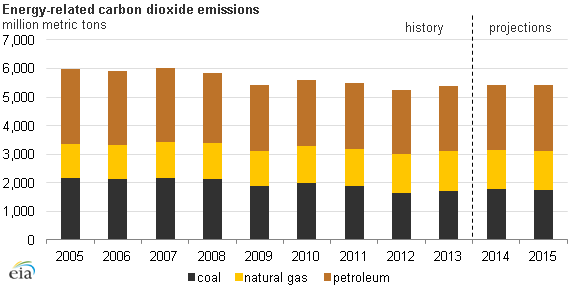 Power sector decarbonization since 2010, as natural gas and renewables displaced coal. Though coal regained some market share among electric utilities in 2013, the EIA forecasts that the downtrend in national greenhouse gas emissions will continue. In its latest “Short-term Energy Outlook,” the EIA predicts that emissions-free hydropower and non-hydropower renewables for electricity and heat generation will grow at a 4.7 percent rate in 2014. Use of hydropower to generate electricity and heat will rise 2.2 percent, while non-hydropower renewables will rise 6.1 percent. 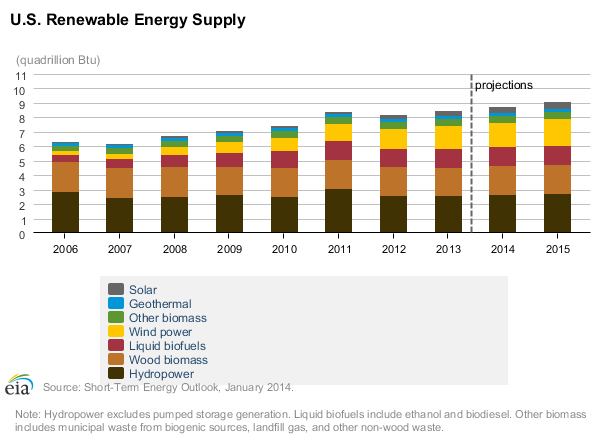 U.S. installed wind power capacity will increase 8.8% in 2014 to reach some 66 gigawatts (GW). The EIA pegs growth in 2015 at 14.6 percent, with total installed capacity reaching 75 GW. Wind-driven electricity generation will increase 2.2% this year and 11.4% in 2015, accounting for over 5 percent of the national total. EIA also foresees ongoing growth in capacity and use of electricity from utility and end-user solar photovoltaic and solar thermal energy sources. The EIA doesn’t forecast “customer-sited” solar energy capacity or use, though it does expect this largest segment of the solar power market to continue to exceed that for utility-scale solar power in terms of capacity and use. The EIA does track and forecast utility-scale solar power capacity and use, however. The EIA projects that utility-scale solar will increase through 2014 and 2015, though it will account for just 0.4% of overall U.S. electricity generation. EIA also highlighted the commissioning of the 280 megawatt (MW) Solana solar thermal power plant in Arizona. Designed and built by Abengoa, Solana is the first utility-scale solar thermal, or concentrating solar, power plant to come online since 2007. Solana is unique: it’s the only solar thermal plant in operation in the U.S. with integrated storage capacity, which enables the system to store and distribute electricity at maximum capacity for up to six hours. EIA expects more of these to come online in 2014.